As 2018 draws to a close, Division 2 continues to serve up more crackers than a festive cheese board. With 39 goals scored over 7 games and only one side failing to find the back of the net this week, there will be plenty of defenders and keepers on the naughty list this year. Revolution were in an overly generous mood in the early kick off as they gift-wrapped 3 points to a struggling Young Guns side. 2-0 up in the second half thanks to a belter from Matt Creighton and a cool finish from Benjy Leung, the Revo defence then proceeded to capitulate, (raising questions if they had been on the egg-nog a bit early), as 3 presents were gleefully accepted by Gordon Chung (2) and Tatlai Wong. Credit to Young Guns who were initially struggling to get a team out but the normally solid Revo backline seemed to be full of Little Donkeys on this occasion. In the day’s other early game, Shui Wei put an end to their recent dismal run of results as they were able to sleigh Samurai Blue 4-2. After taking the lead in this one, Samurai will be disappointed to come away empty handed but comically admitted that they failed to execute a ‘fail proof’ plan. Payman Nejad Safavi and Ahmed Jemli getting the goals that ultimately didn’t matter as Evan Forrester, Eric Cheng, Leo Chan and William Ferdinand sealed the win for Shui Wei. In a ding-dong battle at Happy Valley it was Mes who went home merrily on high as they were able to overcome Dragon Valley 4-2. Mes started well but then surrendered a 2 goal lead as DV’s fan favourite smashed home a 25 yard free kick to begin the comeback. In the 2nd period Mes found their footing and went through the gears to run out deserved winners and keep the pressure up at the top. Stewart McInnes (2), William Harvey and Golden Boot leader Chris Delaglesia were the Three Kings for Mes. Waiting on DV scorers. With that result coming in just before San Pells kicked off, the pressure was heaped on the league leaders to deliver in a tricky encounter against Old Speckled Men. In another match where the forwards reigned supreme, OSM led 3 times but were just unable to hang on as San Pells proved their credentials, fighting back on each occasion to eventually win 4-3. Keith Cowdrey and Richard Bindrup shared the goals with 2 each to seal an 11th win in 12 matches meaning San Pells will step into Christmas at the top of the pile. Waiting on OSM scorers. 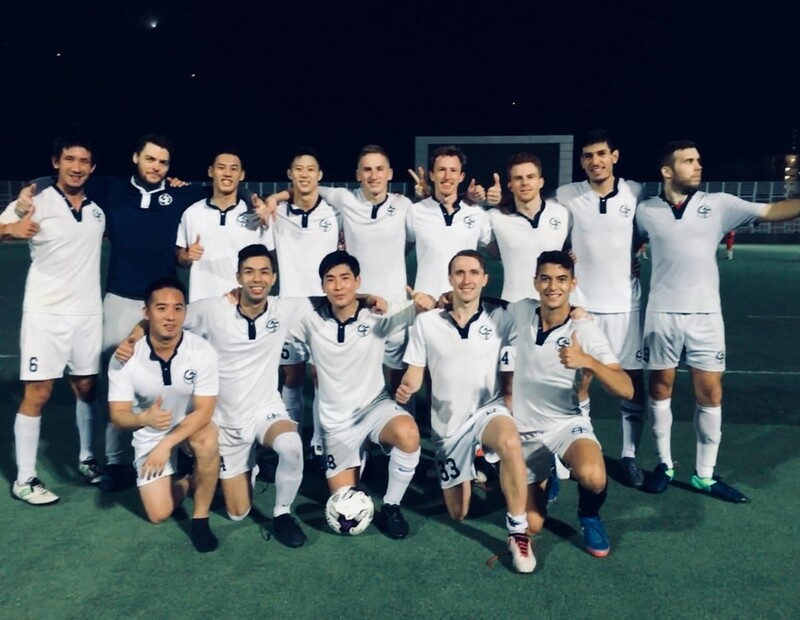 Wanchai Wolves channeled their inner Grinch this week as they shut out an experienced Legal Head side, claiming a 2-0 success. After a tight and goalless first half it was a set piece that broke the deadlock as Ryu Yoshida bundled in at the far post. With Legal Head pushing on, there was inevitably going to be space at the back late in the game and so it proved as the fantastic-festively named Robin White finished off a nice counter attack. The result lifts Wolves into 4th spot whereas Legal Head seem destined for the bottom half. MBFC have had a couple of good results of late but came up against a Vikings side looking to finish the year strongly. There were more goals than there were words in each sides match report as the Danes ran out 7-2 winners making sure it would be a Blue Christmas for their opponents. Soren Kargo (2), Lukas Eades (2), Matt Seddon, Poul Sondergaard and Jacob Bach on target with Pang Chao and Li Ziye grabbing the consolations. Super Monday saw the eagerly awaited KCC derby as Cavs faced off against Royals with both sides having had plenty to cheer already this season. In the season of goodwill the points would be shared in this one as Luca Merlone and Nathan Smith bagged for Royals cancelling out a double from Stefan Fernandes. Cavs remain third but now slip slightly adrift of the top 2’s relentless pace.